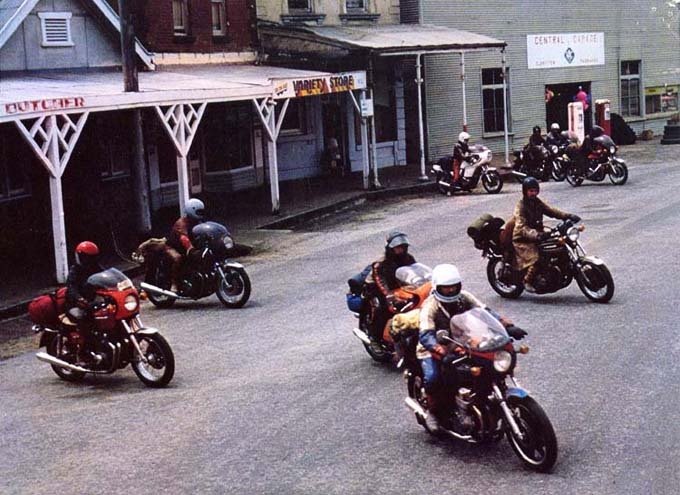 Say the words “best ever motorbike film” to most riders, and you’ll probably hear them namedrop films like “The Wild One”, “Easy Rider”, or “On Any Sunday”. But there’s one that those in the know will tell you trumps them all when it comes to showing the insane rush of riding road bikes at speed; the original Mad Max movie from 1979. Short on cash, George Miller (the film’s writer, director and co-producer who went on to make the Witches of Eastwick, Babe, and Happy Feet) enlisted the help of the Melbourne chapter of the Vigilantes outlaw motorcycle gang… as you do. Giving them access to free bikes and paying them mostly in beer, he let them loose on Victoria’s country roads and filmed the chaos. In the now infamous bridge scene, Vigilantes members were asked to drop and slide two Kawasaki KZ1000’s for the cameras. The riders, trying to get the best shot possible, stayed nice and close to the bikes after they hit the deck. The results? A tumbling 250kg bike comes damn close to breaking a gang member’s neck and the world gets one of the best bike stunt sequences ever filmed. Somehow modern CG doesn’t quite stack up, does it?